Craig Duncan and Kirsten Greer joined me at CJs Off the Square in Franklin yesterday to play Jessica and Justin down the aisle. The weather was beautiful as was the bride, who met her groom at the altar to the strains of “Con Te Partiro”. I so enjoyed that they had composed their own vows to each other after which they sealed their union with a sand ceremony. A good thing since it was too breezy for unity candles that evening. From my vantage point above and behind the guests, the ceremony was gorgeous as the sun went down allowing the strings of festive lights to bathe them in a romantic glow. Congratulations to Jessica and Justin and their families! As this is the final wedding for CJs this year I want to express my appreciation to Amy and CJ for their trust in me and my guys to bring expertly performed music to weddings at their establishment and for their flawless direction every time. 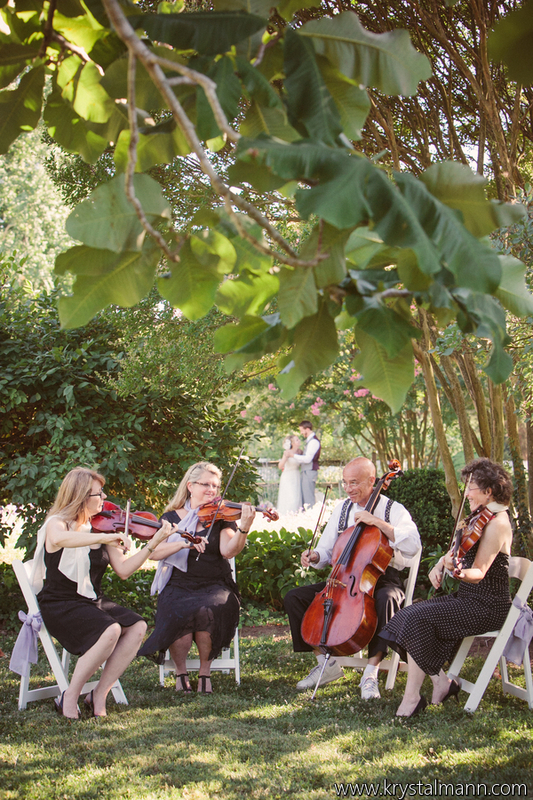 A couple of months ago Silver Strings participated in a photo/video shoot for Wedding 101 at the Hermitage. The theme was “Secret Garden” so we decided to dress in a more romantic, casual way with frothy cocktail dresses and scarves (not Gary of course). Photographer Krystal Mann contributed her skill to that event. Notice the neat effect of having the bride and groom in the background . We had to shift musical gears pretty fast for our second wedding of the day, the union of Jessica and Heyburn, at Houston Station. But first let me digress…if you haven’t seen Houston Station, plan a field trip soon to see it. In back are railroad tracks giving the back area the feel of being at a train station. The inside is a wonderful, eclectic space with tons of flexibility for whatever event that happens there. But as I was saying we (a quartet this time) found ourselves playing rock and roll for the entire wedding from prelude to recessional and loving it. Jessica introduced me to Morning Benders’ “Excuses” as her choice for the wedding party. If you don’t know the group, imagine a cross between the Beatles and Phil Spector. The Beatles’ rendition of “Til There Was You” brought in the family before that. Jessica chose the Beach Boys’ “God Only Knows” for her entrance. After a lovely ceremony including the reading of the Apache Wedding Prayer the newlyweds were “Signed, Sealed, Delivered” by the quartet. I so enjoy working with Elizabeth, owner of Houston Station. She pours her heart and soul into her events, this time even getting a little emotional at times when she spoke of the circumstances of this wedding. I’m humbled and honored to work for and with such lovely people. November 3 found us in the mid afternoon at CJ’s Off the Square in Franklin playing a wedding with a decidedly Scottish theme for Whitney and Collin. The trio mixed Celtic tunes such as “Give Me Your Hand” and “Haste to the Wedding” with traditional classical for prelude. I enjoyed watching some of the guests nodding in time to the Celtic offerings as well as seeing so many of the men in kilts. At processional time the family and attendants entered to “Canon in D” while Whitney chose Wagner’s “Wedding March” (Here Comes the Bride). After the first kiss as husband and wife, Whitney and Collin made their way back up the aisle to “Scotland the Brave” played by bagpiper extraordinaire, Jay Dawson. Congratulations to Whitney and Collin and many wishes for a long and happy life together!